Locations in red are no longer open. Map by Cody Corrall, 14 East. Behind the curtains of a grade school cafetorium in Baltimore, Brian Seyler’s music director gave him a glimpse into his future. Strewn across the stage was an assortment of woodwind, percussion and brass instruments. After trying out a few, the director held a saxophone in front of him. She pushed the keys while he blew into the single-reed mouthpiece. The result was instant, sharp, magnetic. From that point on, Seyler knew he wanted to play music — he just didn’t know he wanted to play jazz. That moment would come later, while getting ready for a band concert in his bedroom. As Miles Davis’ ‘So What’ began to play, Seyler was hit with another sense of connection. He had to sit down and grab something to steady himself. “That was the first time [I realized] how much it was about emotion and how you express it,” Seyler said, recalling the experience. Seyler’s affinity for jazz music eventually led him to DePaul, where he’s currently pursuing a degree in jazz studies. Chicago is a hotbed for jazz, once home to the likes of Von Freeman and birthplace of jazz’s close cousin, blues. While the jazz scene is still alive in clubs and bars around Chicago, remnants of its 20th century glory are slowly fading into its history. 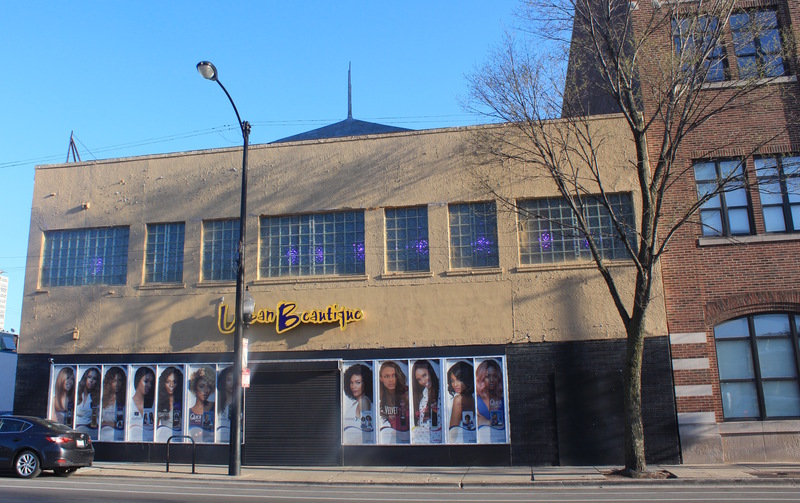 Today, venues like Dreamland Cafe located at 3518 S. State St., where a young Louis Armstrong once performed, have been the replaced by a PNC Bank and row of mid-rise condominiums. The Sunset Cafe — which hosted Charlie Parker, Dizzy Gillespie and Earl Hines at 315 E. 35th St. — was repurposed into an Ace Hardware before eventually becoming cosmetics supply store Urban Beautique. The Sunset Cafe used to be housed in this building at 315 E. 35th St. in Bronzeville. It has since been an Ace Hardware and is now Urban Beautique (Meredith Melland, 14 East). Jazz is a resilient style of music that isn’t bound to the structures that hold it. Why else would it be appropriate for both concert halls and neighborhood bars? Or listened to casually in an elevator or department store? Jazz is everywhere, and its history is preserved in, and respected by, musicians both young and old. Jazz is thought to have originated in turn-of-the-century New Orleans out of the cultural fusion of African and Latin rhythms, slave songs and spirituals, ragtime, blues and classical music. Jelly Roll Morton, a musician in New Orleans, claims to have invented jazz in 1902 by swinging notes and finding a mid-tempo between Scott Joplin-style ragtime and blues. During the Great Migration, many black musicians from the South came to Chicago or New York fleeing Jim Crow laws and seeking opportunity. With the emergence of new lifestyles in the Roaring Twenties came the Jazz Age and the big band era. Large jazz ensembles with multiple players per instrument developed under the direction of bandleader Duke Ellington in New York and King Oliver in Chicago. Chicago danceable jazz swing grew in popularity as white composers like Gershwin broadened their audience and new venues opened up. In Chicago, Earl “Fatha” Hines created a jazz orchestra at The Grand Terrace Cafe at 315 E. 35th St., which was broadcast over radio airwaves throughout the country. Some jazz orchestra venues have facades worn with time but are still standing today. Others vanished from the landscape or morphed into modern function, the classic versions only saved in memory. Jim Trompeter, associate professor of jazz piano performance in DePaul’s School of Music, remembers going to The London House on Michigan and Wacker as a child — now, it’s a hotel. “The London House was the premiere jazz room in Chicago along with Jazz Showcase, and all the biggest names would come to play there,” said Trompeter. The Lincoln Gardens, which later became Chicago’s Royal Gardens Cafe, used to be open at 459 E 31st St.; now, there’s only a run-down office building, public school, nearby condominiums and greenery. In the late 1940s, Hines, Dizzy Gillespie, Charlie Parker, and others developed bebop, swing’s faster, more experimental technique, which triggered other jazz evolutions like cool jazz, free jazz, and jazz fusion. During this era, jazz was at its most popular among DePaul’s college audience: students going to school after the war were studying jazz, attending performances, writing about it in The DePaulia, and even interviewing band leader Stan Kenton. Since then, jazz has been used as a building block for other modern styles, but has lost mainstream popularity and an audience for newcomers. “It’s been a paradigm shift, the kind of technology and people going out to hear music has changed a lot, but still, there’s some great players here,” said Trompeter. 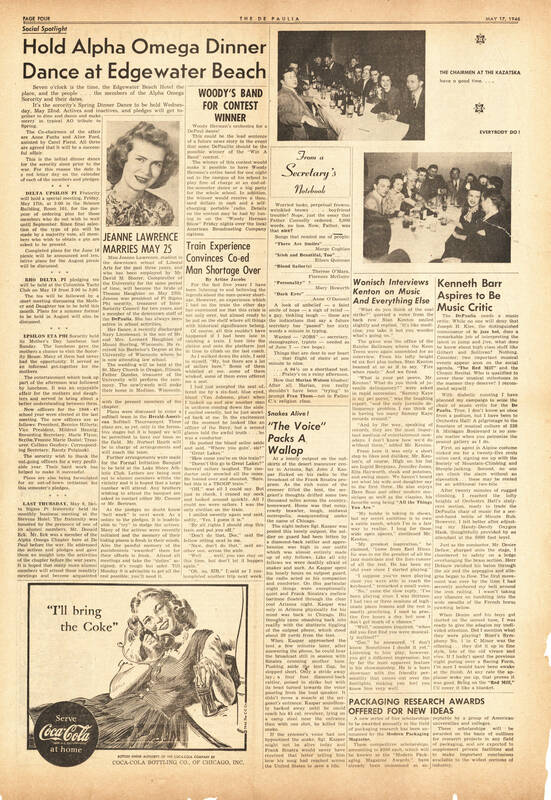 A copy of The DePaulia’s music section from May 17, 1946. For many young jazz enthusiasts and players, the entrance point to jazz is live performance and personal connection. Trompeter’s piano-teacher mother, disc jockey father and jazz-pianist grandmother participated in Chicago’s jazz scene when he was a kid and encouraged him to play. 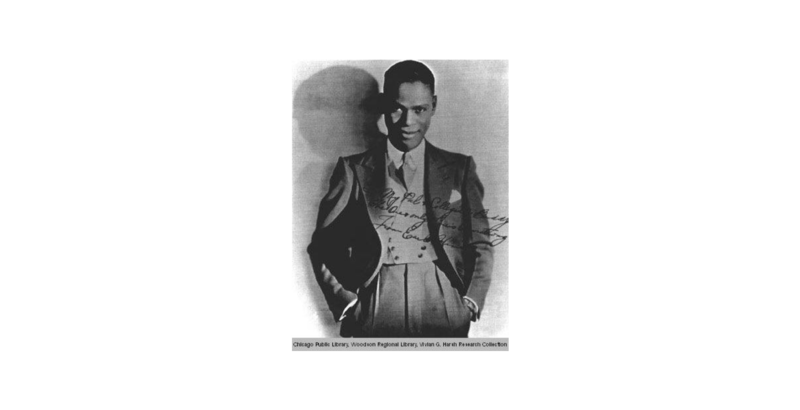 He noted that even though Chicago’s community remains vibrant, it can be difficult for a musician to earn a living on jazz alone. Trompeter gigs a few times a month at Winter’s, Andy’s Jazz Club and The Green Mill. He makes the most gig money when he plays The Green Mill for $350, a rate he said is “unheard of” in jazz. “Great players are making a living and playing a lot of great gigs, but they’re also augmenting it and doing other gigs,” said Trompeter. While getting his master’s in jazz composition from the University of Miami, Trompeter toured with Miami Sound Machine from 1985 to 1988. He also worked in a wedding band and played background music for office parties to make ends meet and keep gigging in jazz. Later, he worked for a jingle company and currently composes video game scores for Scientific Games, in addition to teaching at DePaul and freelancing TV scores. Seyler and DePaul senior Austen Goebel have already immersed themselves in jazz outside of DePaul; they play in a number of different groups on their own, but together they make up half of Goebel’s project Hong Kong. Seyler plays tenor saxophone in clubs like the California Clipper, The Whistler and The Rhythm Room in combos and his band TEALL. He tries to listen to other players in the community as often as possible. The prospects of making a living as a full-time jazz musician are slim, but there are some who love it too much to care, like Goebel. 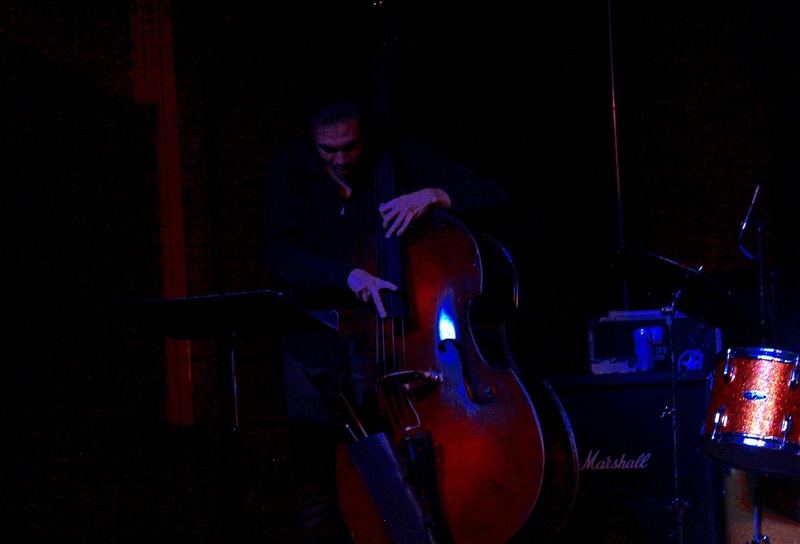 Similar to Seyler, Goebel too had a moment of connection with his instrument of choice — the contrabass. But with play also comes practicality. Guitarist Ariel Glassman, a senior music student at DePaul, has a more pragmatic approach to her career in music. “Once I graduate I plan to take one or two gap years,” Glassman said. “Then hopefully a grad program and maybe going for a PhD in composition and finding a grad school that won’t make me go broke,” Glassman said. Even with her down-to-earth outlook, Glassman is still an active member of the jazz community. In addition to her solo work, she’s also part of the jazz trio Three For All. Lately though, Glassman likes to spend her time writing for big band and incorporating arrangements with rappers. Putting your material out there is key, but Seyler acknowledges the privilege of playing in a city that attracts world-class talent. “If you had told me that as a junior that I’d be doing what I’m doing now, I really would not have believed you,” Seyler said. While he estimates fellow musicians make up the majority of his audience at the clubs he plays in, he is no stranger to the energy a larger crowd can provide. To an average Chicagoan, the history and fate of jazz might be inconsequential. But, like the still-standing Bronzeville buildings of the bygone big band era, jazz still exists and is fostering new growth. A small contingent exists of long-running historic clubs — Jazz Showcase, The Green Mill, Andy’s Jazz Club — that each put on seven shows a week, and these venues have inspired new, less formal jazz bars. Additionally, school programs like DePaul jazz encourage new musicians to hold solo performances, many of which are happening in May. Chicago jazz isn’t flashy and can’t be anticipated, but that’s part of the magic — because, as Seyler said, it’s always better live.